Description : Moths are tiny moths (about 6 mm) commonly called mites that have hair or scales on their heads. 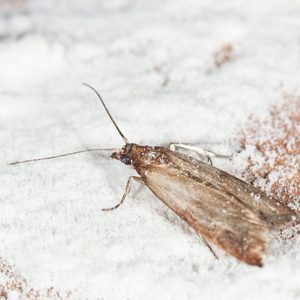 Two species attack clothing stored in the home: the diamondback moth clothes and door-case. Their narrow wings fringed with long hairs are golden or brownish and mottled. Behaviour: These are moths. Females lay eggs in the dust closets or, they set them on a tissue fibers with a gelatinous material. Small caterpillars emerge in a few days, because the egg stage can not survive the winter. The caterpillar spins a silken tunnel that covers the tissue where it feeds, or it builds a silk sheath she carries with her. The fabric fibers and excrement are incorporated. The larva then manufactures a silk sheath for metamorphosis, or she uses the one she was carrying, and installs it in the crack of a wall or ceiling. Inside, it first into a chrysalis and becomes a butterfly. The caterpillar can live without food for some time, and it may take several weeks or more than three years between the caterpillar stage and that of the winged adult. The female dies when the spawning period is over. The male saw several more weeks during which he continues to mate. All males can fly, unlike a few females. Other adults will instead run or jump. 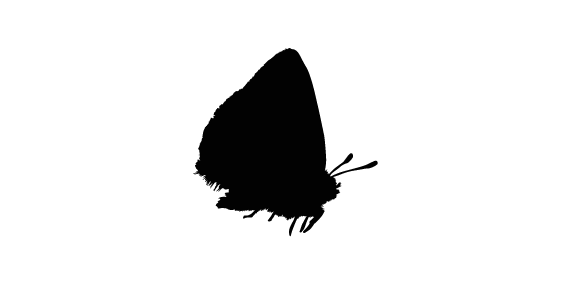 Some authors argue that one can distinguish these little butterflies of those who infest food products in that they avoid light and they are trying to hide as soon as the mind. Where we see them in the house: The adult in flight is rarely seen since active at night. The source of infestation is discovered in a little disturbed place such as a box of tissues stored for a long time or clothes that are not often worn. Habits: Moths have, in the state of caterpillars, enzymes allowing them to digest keratin. This protein is found in hair and fur, hair, feathers, horns, hooves and nails. Inside the houses, caterpillars infest blankets and pillows and clothing. They prefer animal materials such as wool, but they can also make holes in cotton and linen as well as in synthetic fabrics sweaty, food or grease from the hair. They also attack cereals, dairy products, meat, cayenne pepper and ginger, among others. In addition, they can take refuge in plant substances used to stuff furniture (such as foam), they will not eat. In the wild, they feed on pollen, ticks, dead insects, animal carcasses and exuviae (old skin) snakes. It can also be found in bird nests, shelters wild bee or under bark. For cons, the butterfly does not eat at all. Ringworm carpet at the caterpillar stage, burrows into rugs, tapestries and upholstery furniture, while the two moths which he is best discussed in the text are living at the tissue surface. Control methods: Make sure that a mouse carcass or trapped squirrel is causing the problem. Find and destroy all immune to bat or abandoned nest of birds, mice or wasps. Vacuum to remove the larvae hide in the cracks in the floor and Fix cavities. Adults may be trapped with an inverted pot under which there is introduced a carton. One can also use sticky tape sold in the market to trap flies or sticky traps cardboard. These would be most effective when added thereto a bait such as sardine oil. A synthetic pheromone that mimics the female emits to attract the male, may also be added to these traps that will be useful to detect the presence of these insects to control a small infestation. When tissues are infected, it must be taken out to the outside, and the brush in order to destroy the fragile eggs and dislodge caterpillars. These do not survive if the garments are exposed two or three hours in the sun during the summer (according to some) or a room heated to 37 ° C for a week or 41 ° C for four hours. Can also be subjected to sub-zero temperatures by placing the outside or in the freezer for two or three days. Make them suffer large temperature differences is another solution. Microwave treatment showed some effectiveness. Only heavy infestations may require the use of pesticides. Preferably used diatomaceous earth. She scratched the bodies of caterpillars die from dehydration. There are also other options (permethrin). In heavy infections, it has been necessary to conduct atmospheric treatments. It would be better to use a professional exterminator to find the right products for the type of insect to be eliminated. Do not wait to be infested! For the extermination of moths, call Groupe AZ Extermination. His professional inspection is free, effective and very fast.